Published Saturday May 5th, 2007 via a mobile phone. 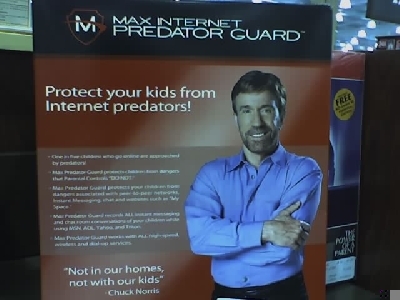 Chuck Norris will protect your kids on myspace! If George Foreman can grill my burger, Chuck Norris can protect my kids (I don't have any kids) ...Burgers are tasty!!! Is Chuck's quote: " Not in Our Homes, Not With Our Kids" ? What market does this target?? A better question: What the hell does this software do, exactly? How does software detect an "Internet predator"? ... and.. did Chuck really say what's quoted? lol..
http://www.max.com/site/predatorguard.chat.shtml I am a NIFOC BDG!!!!111!!!1! !